Paper handle for less risk of injury. Paper handles protect the environment and are biodegradable. Effect: The maximum possible concentration contained xylitol (about 99.5%) has optimal tooth care. 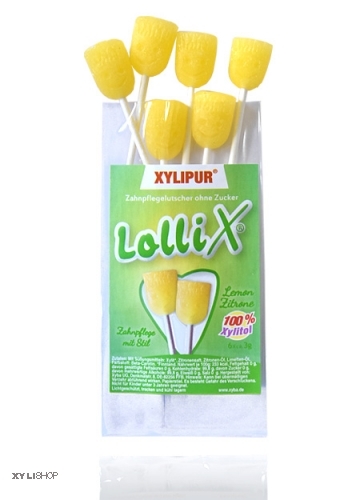 Usage: 1-2 Lollix daily (about 3-6g) or 2 to 3 teeth (about 2-4,5g) or the combination of both. The application should be spread throughout the day and always after meals and after brushing. 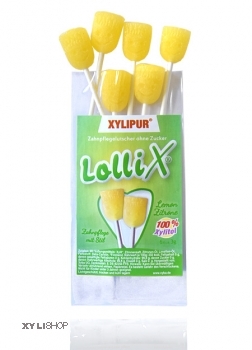 A long exposure time of xylitol in the mouth is advantageous.